The Church is under attack around the world. Internal scandals are damaging her credibility. Numbers of priests and religious are falling in Latin America, as elsewhere. Yet at this very time in one of the most anti-Christian countries on the continent, one particular community shines forth like a beacon for the future. 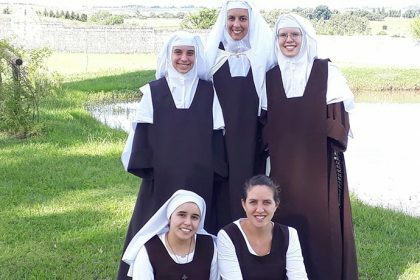 They are the Discalced Carmelite Sisters in Florida, Uruguay. There are twelve Sisters, eight permanently professed, two with temporary vows and two novices. 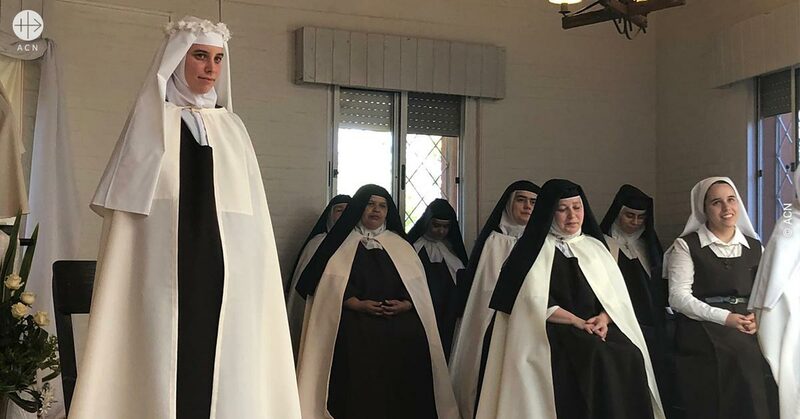 They are young, and other young women are also seeking admission to the convent. Each has her own story to tell, of how God called her, tenderly but clearly, invisibly but unmistakably, quietly but insistently. Each of them could make her own the words of the disciples on the road to Emmaus. “Did not our hearts burn within us as he spoke to us…” (Cf. Lk 24:32). Sister María was just 16 when, in 2013 while on pilgrimage, she first recognised the urging in her heart. “You have given me everything, Lord, and I want to give everything to you.” This was her prayer, even without knowing exactly what God wanted of her. A radiant bride of Christ: Sister María, 22, in the convent garden. to dissuade her and prayed desperately that she would not enter the convent. A growing community: three professed Sisters with a novice and a postulant. But the Sisters were also praying in their convent. One night María wrote a loving letter to her parents, climbed out of the window and knocked on the door of the Carmel. 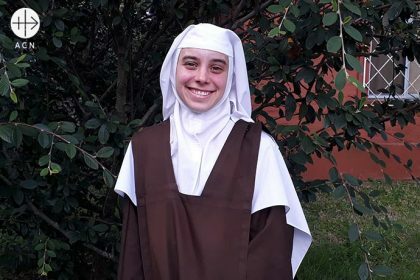 Today she says, “I am happy, happy to be the bride of Christ.” Sister María Belén also felt her heart burning. The more she became involved with her parish, the greater her longing grew to belong totally to God. Then her uncle, who was a priest, died in a car crash. In the midst of her grief she felt the open arms of God. She too read the Story of a Soul and then, two years ago, when she became acquainted with the Carmel, she knew: “This is my home, my doorway to heaven.” Now other young women are knocking on the door. They too want to give everything. But there is not enough space to accommodate them. An extension will make space for five additional cells. This is a sign for us, you could say, for the little online shop they run, selling their embroidery, needlework and handicrafts, will never cover the cost. So we have promised €70,000.